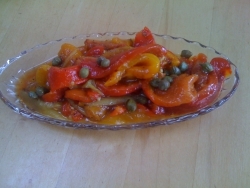 This sweet pepper salad has a hint of heat from the Hungarian peppers and crushed red peppers. You can adjust the heat by changing the amount of crushed red pepper used, and by keeping or removing the seeds from the Hungarian peppers. Roast peppers, then peel and remove seeds. I place peppers on top rack of broiler turning until all sides are charred. To remove skins, let sit until cool. Skins should remove easily by hand. After de-seeding, spread flat and scrape off remaining skin with a knife. Slice thin, then toss with red wine vinegar. Add oil, garlic (crushed and sliced), crushed red pepper, and mix. Set aside for a couple of hours at room temperature for flavors to blend and develop. Adjust seasoning.